Curve your fingers and play with the tips of your fingers. 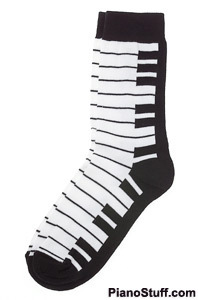 Piano Gifts - Cool Gifts for Piano Players! Practice slow! It the mistake of many beginning piano players to try and rush when they think they're getting it. Be patient and keep it clean first and foremost. Speed will come gradually on its own. Tune it or die! This is a funny old saying that applies to all instruments but it is so true and so important. Preferrably, you should have your piano tuned by a professional. Pianos will tune up best in mild, dry temperatures. Create! Many young piano players are used to reading everything note for note and some never stray from the page. Make yourself play something creative and unique. Challenge yourself to stray from the music now and then and improvise. Let your creative juices flow. - Make music! Remember to utilize all piano resources at your disposal. Aside from teachers, there are method books, piano dvds, lessons in software packages, internet sites that specialize in piano, and more. Try to play with other musicians as quickly as possible. This interaction is priceless in applying everything you've learned on the piano to a real-world musical setting. It's been said many times before... practice,practice, practice! Clean your piano with a very soft cloth or a feather duster. Do not use furniture polish. Too much of this over time can break down the finish and moisture can get to the wood. Find a piano teacher that suits your, or your childs, personality. Meet with them before they start training you or your child to see if it will work or not. Get recomendations from others who have studied with them before. It is important to keep your fingernails trimmed as low as possible. The clicking of your nails against the keys becomes a distraction, especially to your instructor. Because of the angle in which your fingers are required to rest, you should keep your nails leveled with the tip of your finger. As a technical exercise, try to "dip" your hand toward the direction it is playing a run. For example, if you are playing a two octave ascending C major scale with both hands, tilt your hands slightly so that your right pinkie and left thumb are the closest fingers to the keyboard. Hanon exercises are good for implementing this widely approved technique. Many players and teachers insist that you can change the tone of the note not just by how hard or soft you strike the key, but in the way you strike the key (ex. pulling at the key, v/s pushing into it). Others disagree. Try it for yourself and see what you think! An investment in the Harvard Dictionary of music will make sure you can always find out what any obscure markings on your sheet music mean. When playing an ascending passage, bring the thumb under the rest of the hand, rather than resetting the placement of the hand all at once. This will make for a smoother phrase. When descending, do the same, but with the pinky. Train your ear as well as your hands! Try to play melodies and eventually songs by ear. Start by listening to just a few notes at a time on a favorite recording. Consistency is key. You'll be surprised how much you can lose on a piece you're studying when you lose a few days of practice. Try to do a recital, competition, or graded jury now and then. This type of goal will keep you on track, almost like some runners do when preparing for a marathon. There is excellent piano music in many genres. Stay open to all of them, but concentrate on those you like best to keep it interesting for yourself.